The woman who put out the "Debtor's Revolt" video on Youtube was on Suze Orman this weekend. I urge you not to jump on her bandwagon. If you have credit card debt and the bank jacks up your interest rate then shop around and get youself another credit card. There is no need to stop making your payments and trash your own credit out of a desire to make some sort of statement. The best way to fight the bank is to simply take your business else where. Your primary goal should be paying off your debt. If you don't have credit card debt then the bank has no power over you. Its only if you are carrying debt you can't pay off that you'll have a problem if the bank raises the rates. So to avoid the situation entirely you should focus first on paying off your debts. Getting mad at a bank our upset at over the way they treat you is not a good reason to do something in haste that will just trash your own credit. That will just make your own situation worse. Now you've got debt and bad credit. That bad credit will likely cost you quite a bit in the long run. Next time you want to borrow for any reason you'll pay higher interest. Your insurance rates may go up. It might be harder to find an apartment or even land a job. If your credit card interest rates are raised arbitrarily then I understand if you get angry and want to make a statement out of principle. But you don't have to trash your own credit and default on your debt responsibility to make a statement. Taking your business elsewhere will have an impact. If everyone stopped doing business with a bank then that would kill them as surely as anything. New Car Deal : Should You take Cash Rebate or Low Interest Financing? If you pay attention to new car advertising when they offer buyer incentives they are usually offering a cash rebate or low interest financing. So you can either get $2000 cash back -OR- you can get 0% interest on a 36 month loan. The key word in that sentence is OR because it means you're choosing between two incentives. To know which one is better you first should shop around and see what kind of interest you can get otherwise and then compare the two choices with an online calculator. Bankrate has a calculator to compare low interest loan versus a cash rebate. Right now Ford is offering a 0% loan for 36 months -OR- a $2000 rebate on a F150 truck. Lets say the truck costs $25,000 total new and the best interest you can get on a loan otherwise is 7%. If you plug all those numbers into the bankrate calculator they say that "You would save $625 by taking the lower interest rate." So you should take the 0% loan instead. You'll save more in interest than you'd save with the $2,000 on a 7% loan. Nissan is offering a deal where you can get a Nissan Sentra with either 0% financing for up to 60 months and $750 cash back -OR- you can get $2000 cash back. To evaluate this deal you can first figure that either deal will get you $750 cash back. So the difference is 0% financing or $1250 cash. Take the price of the car and subtract the $750 and then compare the difference between the other two features. If we assume that the Nissan Sentra will cost $20,000 then you figure the price based on that amount less $750 or $19,250. If we use the calculator and compare a 4 year loan at 0% with the price of $19250 versus taking the rebate of $1250 and financing at 7% then the calculator says: "You would save $1445 by taking the lower interest rate." So again the cheap financing is a better option. If you can get a really good loan on your own then a 0% loan isn't as beneficial. Lets look at both those examples again and see how they compare if you can get a good finance rate at your bank. Lets say that you can get a 4% loan from your credit union. If you run the numbers again then you find that for the Ford F150 you save $500 with the rebate but for the Nissan Sentra you save $290 with the lower interest. I don't know of any easy rules of thumb to compare low interest financing versus cash rebate deals. The best way to compare the two is to use an online calculator. Personally I think buying a newer used car is your best option financially. But many people like new cars based on their reliability and there might be some very good deals out there nowadays on new cars. And there may be certain situations where buying is more compelling like when you get a tax credit for buying a hybrid. You may recall that Washington Mutual (Wamu) went under and their assets were acquired by JP Morgan Chase bank. The Seattle Times has a 2 part article (part 1 & part 2) on the demise of Wamu. In the first part of their story they reveal that someone at Wamu had made a 2nd mortgage loan to OJ Simpson. The loan was made after he had been found liable in the civil lawsuit and so he wasn't in healthy financial shape at the time. In the documentation for the loan there was a letter from Simpson saying "'the judgment is no good, because I didn't do it." The $8,000 tax credit for new home buyers has lead to a lot of false claims and some outright criminal fraud. USA Today article reports that there have been 1.4 million tax claims on the credit and that the IRS "... has opened 107,000 civil cases related to the credit and identified 167 criminal schemes." They even cite one case where a 4 year old was listed as claiming the credit. I am guessing the parents were existing home owners so they filed as if the 4 year old bought the home in order to try and claim the credit. Its clear that things are not going well for Detroit. They have the highest unemployment and one of the highest foreclosure rates. The situation is so bad that the auction of 9,000 homes or vacant lots that were foreclosed on due to taxes by the county was a "flop". With a minimum bid of just $500 per item less than 20% was sold. Of course many of those buildings are not habitable and the better ones sold for higher prices. When I went to college it was pretty clear to me at the time that student tuition wasn't a big factor at the school. I went to a large public university with an emphasis on research. The school got most of its funding from research grants and state tax support. Tuition was a small portion of their income. This is the case at most universities in the USA. Tuition from students is a fraction of the revenue at colleges. This relatively old study from the Dept. 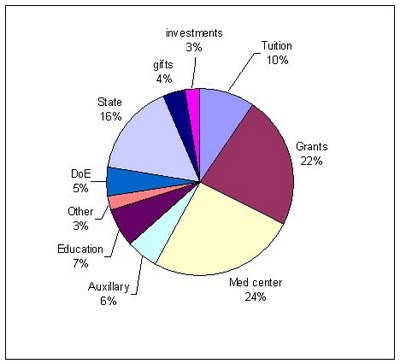 of Education cites tuition contributing only about 23% of revenue for public research/doctoral universities as of 1998. Grants, medical center and state support are the largest sources of revenue for the UC schools. Of course every university is a bit different so they will have a larger or smaller portion of their revenue coming from student tuition. But its a safe bet for most public universities out there get a majority of their funding from sources other than tuition. Private schools tend to get a much higher percentage of their revenue from tuition. However for private schools the funding mix may vary more. The Dept. of Education study from 1998 shows that tuition is 49% of revenue for private doctoral/research universities. Larger schools may get substantially more of their revenue from grants, gifts or through funds generated by their endowment. Stanford's budget shows that they get about 17% of their income from tuition which is less than most private schools. I'm not really a fan of investing in gold. I don't think its a safe investment and it doesn't perform well over long term periods. Thats my personal opinion on investing in gold. However I can understand the interest in gold for many people so I understand if someone might want to have some of their assets in gold. If you are going to buy gold then buying an ETF (Exchange Traded Fund) is a good way to go. With the gold ETF you are buying a share of gold assets owned by the ETF. This is an efficient way to buy gold without having to pay a sales markup when you buy or pay a sales fee when you sell. There are however expenses in the ETF fund so you should be aware of those. ETFs have expense fees of around 0.4% to 0.5% level. I would recommend keeping no more than 10% of your assets in gold. Gold can be a volatile investment and holding more than 10% of your assets in gold could be pretty risky. Easily bought and sold. Its fairly easy to buy or sell an ETF and you can trade your gold assets on the market quickly. If you bought gold bullion or coins you'd have to physically get the gold and take it to a dealer and possibly shop around multiple dealers to get a good price. It removes the risk and/or cost of holding physical gold bullion. If you bought some gold coins or bars and held them yourself you'd be running the risk of a burglary or paying the cost to store the gold in a safe deposit box. Low fees compared to buying physical gold directly. When you buy and sell physical gold you pay fees to do so. I googled "buy gold" and I found a site selling 1 oz. gold coins for about $1,097 today. The price of gold bullion is at $1038. So thats about a 6% markup you're paying to buy the physical gold coin. Be aware of expense ratios. Buying gold via an ETF does come at a cost. They charge an expense ratio of around 0.5% give or take. This is a 0.5% cut off the top of your return every year. You can't hold the gold in your hand. If you buy an ETF its an electronic record of your ownership rights. Its not pretty shiny thing you can hold in your hands. Some people enjoy owning gold as a physical object and with an ETF you lose that aspect. But I would caution for people to think about the fact that if you're buying gold because its shiney then thats not a very good investment strategy. To sum up: If you plan to buy gold as an investment then buying a gold ETF is a good way to go. In advanced preparation for Halloween, this blog round up is on articles related to saving money for Halloween. Wisebread has: How to Save Money During the Halloween Rush with money saving ideas on costumes and decorations. Here is a non blog entry: If you're looking to save on Halloween costumes you might try shopping at Half Price Costumes through Ebates. You can get 10% cash back from Ebates and Half Price Costumes has many costumes for under $20. Or you can cut a couple holes in a sheet and make a ghost costume. If the sheet isn't white then the costume can be one of the ghosts from Pac Man. Last week I wrote about the high cost of private school tuition. If you live in an area with poor public schools then you might consider sending your kids to private school to get them a better education. Where I grew up as a child our public schools were quite good and I got a pretty good education. 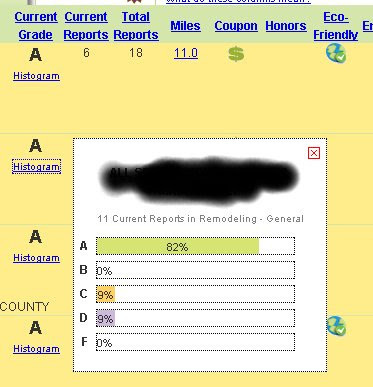 However the city that my wife and I live in right now doesn't seem to have an especially good public school system. The test scores for our city's schools are a little below the state average. Thats not horrible but its not really good, its well just average. If we want them to have a great education then we might want to look elsewhere and private schools are an obvious alternative. In a comment to my last article Financial Samurai mentioned another to get a better education for your kids. One way to get your kids a better education is to simply move to a better public school district. This is how it would work: Say you're currently in a bad school district. Your local schools have all sorts of problems, its underfunded, theres little opportunity for academic growth and they consistently have poor test scores. In the next city they have good schools, its an affluent area and the schools are well funded with good academics. You simply move to the better school district and now your kids are in a better school. Simple as that. Of course moving does come with some costs. Which is the best option? It depends on the exact costs. The exact cost of moving to a different school district will vary widely depending on your exact situation. If you rent then the cost may be additional rent. Say you pay $800 rent now but the better school area is $1000 a month. Thats an extra $200 a month for 4 years or $9,600 total. On the other hand if you own a house worth around $300,000 and move to a similar house you might have to pay $100,000 more for the same size house in the better district. The cost of selling your home and buying the other home will cost you $20,000 to $30,000 in sales fees and loan costs. You might have higher property tax as well to help pay for that better school. Such a move could cost you upwards of $40,000 or more. Does it make sense? Maybe. It really depends on the situation and what the costs are. If you're merely moving from an OK public to a slightly better public school then that is not really worth spending a ton of money on. But if the public schools are significantly better in one area compared to another and you can afford to move but can't afford private school then moving might be a very good option. Its probably best to think in advance and buy your home in a good school district ahead of time. That way you won't be facing the costs of moving later just to get into that better schools. Does spending more make sense for you? It depends on the situation. Of course you have to ensure your family financially before you spend extra money on education. You need to put food on the table, get health insurance, save your your retirement and make sure you have an emergency fund. Then if you still have money to spend you might look at spending more on education. But its not always necessary. Maybe you're already in a good school district. I am not against public school in general. I went to public schools and I think there are many fine public schools. But the quality of public schools can vary greatly. It makes sense for a parent to want the best education for their child so considering the options available is natural. What Happens to Your Pension if Your Employer Goes Bankrupt? If you have a pension and your employer goes bankrupt then does that mean that your pension will disappear? In a word : no. The Pension Benefit Guarantee Corporation (PBGC) guarantees pension plans so that if an employer fails then the PBGC will take over the pension and pay the benefits. When I say pension I mean a pension with a defined benefit. This is the old style of pension that would for example pay you 2% of your pay for every year your worked, so if you worked at a company for 35 years you'd retire at 70% pay level. What does the PBGC cover? There are limits to what the PBGC covers. They only cover defined pensions up to a maximum amount. Currently in 2009 the maximum is $4,500 a month for a single beneficiary or $4,050 for a 50% joint survivor pension. The PBGC does not cover things like medical benefits or death benefits. 401k's and IRA's are not pensions. 401k's or IRAs are not a defined pension plan and are not guaranteed by the PBGC. What you have in a 401k or IRA is based on how much money you put in and how your investments have grown. 401k's and IRAs are safe from an employer bankrupt by their nature as that money is already in a dedicated account and can not be touched by the company. So the employer can't raid or spend your 401k. There is no guarantee that your 401k investments won't go down in value. However if the company managing your 401k goes bankrupt then your funds are insured against their failure. So bottom line : If you hav an 'old style' defined benefit pension then there is no need to worry about your pension if your employer goes bankrupt. The PBGC will insure your pension. 70% off Restaurant.com $25 Gift Cert. orders + free $10 Lobster Gram offer. Use code PUMPKIN and Pay $3 thru 10/25/09. Fabulously Broke is hosting the #227th Carnival of Personal Finance. Fabulously Broke took a novel approach to the carnival and wrote it in the style of telling the story of their own personal finance journey. My article Cheap Ways to Delay Expiration of Airline Miles was included in the carnival. How much does it cost to raise a child & 10 ways to cut the cost! from Christian Personal Finance Rather then the vague giant "it costs $250,000" to raise a kid they give concrete numbers on what they actually spend on their children. Has 10 ways he at least tried to make money with varying success. I like this one since he gives some examples of stuff he tried that didn't work so well and some that worked better. There are a ton of other great articles on the carnival so take a minute and check it out. Treasuries are not paying very well right now. Interest rates are low in general. But in the past treasuries and interest in general have been higher. The Federal Reserve has data on the history of various interest yields including corporate bonds, treasuries, CDs and mortgages. I pulled the 10 year treasury bond rates off that page. The chart goes from 1962 to 2008 and in 2008 it was 3.7%. That 3.7% was the lowest they've been for over 40 years. 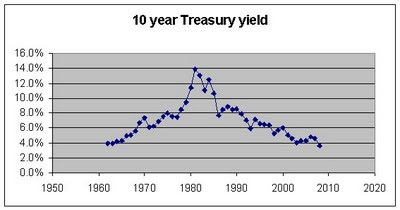 The average yield from 1962 to 2008 was 7.0%. The high was in 1981 when it hit 13.9%. I had previously tried to figure out how much it costs to water my lawn. At that point we had just recently had our front lawn landscaped and got an automatic sprinkler system installed. WE had not had automatic sprinklers before and I wasn't too worried about keeping the lawn nice and green so previously we hadn't spent anything on watering the lawn. But with the nice new lawn we have now we want to keep it nice so we watered it all summer after it was put in. I got the latest water bill recently. I'm sure that millions of people have been waiting anxiously to find out exactly how much it costs me to water my lawn so I feel obligated to let everyone know. From my previous estimates I figured that the cost of watering the lawn was somewhere between $8 and $60 a month. The actual amount falls in that range. Our latest water bill was for $170 which is $70 more than a normal bill. However our water bills are for 2 months. So thats $70 for two months of watering. Furthermore we watered the lawn 3 times a day during the first 3 weeks because it was new sod and the landscaper told us that you should water it that much extra the first 3 weeks to make sure it grows well at the start. So we were basically watering 3 x 3 weeks + 1 x 5 weeks worth over the 8 weeks which would equate to using 1.75 times as much water as normal. If we hadn't watered triple the amount for the first 3 weeks then our bill would have been closer to $140. Based on our first bill and considering how we watered extra the first three weeks, I'd figure that a normal month worth of watering our lawn will cost us $20. I got a comment in response to my post about BigCrumbs saying there is an extension for Firefox to automate the BigCrumbs rebates. Sounds like a good deal. I haven't used the extension myself. The CashbackAutomator for Firefox automates your rebates with BigCrumbs. Normally to get a rebate from BigCrumbs you'd have to 1. go to BigCrumbs 2. find the merchant 3. follow the link to the merchant 4. buy stuff at merchant. With the automator all you'd have to do is 1. go to merchant. 2. click on automator 3. buy stuff. Wisebread discusses an interesting energy saving device with their Ode to the Ecofan. Looks like a neat device to improve efficiency of wood or oil burning stoves. JD at Get Rich Slowly talks about The Guilt of Wealth and gets a lot of comments on the topic. Personally I don't think you should feel bad about success that is well earned, but I do think success is a mandate to philanthropy. In recently lost over 3,400 miles on US Airways because I didn't have any activity. I received mail from them saying my miles were nearing expiration but I didn't act quick enough to keep them from expiring. Unfortunately those miles are now wasted. However if I'd found some way to generate activity on my account I could have kept the account active and saved the miles. Before I've found that there are often fairly cheap options available to generate some new mileage activity on your airline miles account and keep your miles from expiring. You might even find a free option to get miles. First thing I'd do is see if I can find a promotion offer for free miles. On occasion airlines will offer free miles if you sign up for their newsletter, fill out a survey or something along those lines. I've seen a few such promotions on the Fat Wallet Forums. So you can look their to see if there are any current free miles promotions. You might also try searching google for "free miles" plus the name of the airline, for example "free miles united" might turn up some offers to get free miles on United. The free promotions are pretty random and hit or miss so I wouldn't count on them, but it is worth alook. If you can't find a free mileage promotion then it may be worth paying a few bucks to generate some miles. Cheap Option : Use Skymiles Dining program and eat at Burger King or other cheap restaurant. OR shop at a merchant in their Skymiles Shopping program and buy something cheap. Cheap option : Unfortunately there really isn't any cheap way I can see to avoid expiration. Cheap Option : Use Mileage Plus Dining program and eat at Burger King or other cheap restaurant. I haven't looked through all the airline miles programs. If you have miles on a program that is not on this list then look at the program partners and see if they have any options to make a donation, do some online shopping or eat at restaurants as those are likely to be the cheaper options to generate some extra activity. Is it worth spending money? If you don't have at least a few thousand miles it may not be worth spending money to keep the miles active. A few thousand miles is probably worth spending a few bucks to keep. If you figure that an airline ticket usually runs $250 or more then 25,000 miles to get a ticket would mean that miles are worth approximately 1¢ each. If you have 5,000 miles then that has an approximate cash equivalent value of $50. The 3,400 miles I lost from US Air were worth roughly $34. You may have to act months in advance. Some of the cheap options I mention above can take 6-8 weeks to credit your account with the miles. If you have miles due to expire then you should act sooner rather than later in order to try and keep the miles active. According to the Department of Education the average cost of tuition for one year of private school for K-12 is $6,600. But there can be a wide variation in costs. You will generally pay more the higher the grade so high school is more than than middle which might be more than elementary school. Average cost for elementary school is $5,049 and average cost for secondary school is $8,412. I used the site Private School Review to find data on various schools. They have listings of private schools with basic data on the enrollment, student : teacher ratio and nature of the school. The site might list the tuition but usually I had to go direct to the schools website to find their tuition & fee rates. School costs may also vary some depending on the nature of the school. Catholic or other religiously affiliated schools may be cheaper due to support from the church and secular schools may be more expensive as they lack church funding. Schools in my area vary in price from $5,100 to $22,500 per year depending on the grade and the school. One school a couple miles from us has K-8 grades that range in price from $5,100 to $6,900. Another K-8 school is $6,600 a year for all grades. A local private high school has tuition of $9,400 a year. All of these schools are religiously affiliated. A non-sectarian school in a nearby town has tuition rates of $19,500 for grades 1-5 up to to $22,500 range for high school grades. Schools may charge some hefty fees in addition to the tuition. The expensive non-sectarian school in my area has a $800 bus fee, book fees of $100 to $850, sport fees up to $150 per sport and other fees. You could end up paying an extra $1,800 more a year in fees. Time and other financial commitments might be required. Other schools may require parents to participate in fund raising and volunteer activities. One school here requires parents to volunteer 35 hours a year or pay $15 per hour and buy $2,200 worth of certificates at local merchants or pay $150 in fees. Discounts, scholarships, tuition or other aid may be available. Many of the religious schools have a discounted tuition rate for people who are members of the church. People with low income may be able to qualify for financial aide or tuition scholarships. You can get 12% off Equifax products via Ebates. You can get your Equifax credit report and Equifax FICO score for $15.95 and the 12% discount will give you a $1.91 refund via Ebates. Ann Taylor has 5% back plus $25 off a $125 purchase. If you aren't currently an Ebates member then this is how it works.. You sign up for an account on Ebates. Then you find the online merchant you want to shop at on the Ebates site. From the Ebates site you follow their link to the merchant. Once at the merchant site you buy your product normally. You'll automatically get a credit on Ebates for the purchase. Then later you'll get a rebate from Ebates via Paypal or a check. I've been using it for a while and its fairly easy and I haven't had any problems with it. Its a good way to get a few % back on your online purchases. If you lack health insurance or know someone who does I found a handy resource. This site, Resources for the Uninsured, has guides covering each state. The guides give various situations where you might find yourself without health insurance and then discusses the possible sources available to you in your state. Many of the options are available to everyone in all 50 states but many other options will vary from state to state. Below are some financial Rule of Thumb's that I use. (Is it Rules of Thumb or Rule of Thumbs? I didn't major in English. ) Some of these are rules I've gotten from other people and some are ones I've made up on my own. Maximum Student loans : Your student loans should be less than your expected starting salary. For example: if you are going to school to become a teacher and you expect to make $35,000 a year starting, you should not get loans for more than $35,000. Saving on gasoline : Don't drive over 1 mile to save 1% in gasoline costs. Example: If gas is $2.50 at one station nearby and $2.45 at a station 3 miles away then then you're driving 3 miles to save 2% which is more than the 1 mile / 1% rule. Rental Investment Costs: Amount to pay for rental shouldn't be more than the monthly rent x 100. Example: a house rents for $1,000 a month so $1000 x 100 = purchase value of $100,000. A while ago a relative of mine had to pay a tax penalty since he had setup an IRA when he didn't qualify to do so. I setup my Roth IRA with a discount broker without having to give them details on my eligibility. There doesn't seem to be any checks or tests to see if you're actually eligible to have a Roth IRA before you setup one with your broker. So there doesn't seem to be anything stopping someone from creating a Roth IRA when they really aren't eligible. An individual could setup a Roth IRA even though they aren't eligible and then end up facing a tax penalty. So its important that you make sure you're eligible for a Roth IRA before you set one up. It seems to be common advice to setup a Roth IRA for a child. But a child isn't usually eligible to have a Roth IRA because they don't have compensation. The rules for Roth IRAs are laid out by the IRS. Earn less than $116,000 for single or $169,000 for married. The vast majority of people earn less than the income limits so that doesnt' disqualify many people. The other requirement of having taxable compensation is something that more people might not meet. This is what would make children ineligible in most cases. What exactly qualifies as taxable compensation? Taxable compensation is defined by the IRS in the traditional IRA descriptions. earnings and profits from property. any amounts you exclude from income. Furthermore the amount you contribute to your Roth IRA is limited by the lesser of your taxable compensation or the contribution cap. So if you have say, $3,000 in taxable income then that is lower than the normal $5,000 limit and you're only able to contribute the $3,000 lower amount. Bottom line: Make sure you are eligible for a Roth IRA before contributing to one and a key eligibility requirement is having taxable compensation. Currently I have a very healthy annual salary of over $100,000 including bonuses. My spending rate reflects my income in many ways. I have cable TV and we take vacations and eat out a lot. Even though we spend a fair amount we still save about 30% of our gross income. However my budgeting is based on a relatively high income. If I made less then I would have to significantly reduce our spending in many categories. As a hypothetical situation I decided to look at a theoretical budget based on an income of $42,000. First lets figure out what taxes and health insurance would cost. I'm basing the taxes on estimate for married couple filing jointly. The exact state tax rate would vary depending on the state you live in. I'm using a rough 5% tax rate on the $20k that would be taxable. This is a very rough guesstimate figure. So thats $2,635 a month after health insurance and taxes left for us to live on. Now that I know how much we have available I'd go about making a rough budget built around that. Right now a major expense is our home mortgage. Owning a home around here is fairly expensive. With an income level of $2,635 a month owning a home would eat up too much of the income. I'd rent a home instead. This would cut down our #1 expense into a reasonable level. If we bought a home the cost would eat up too much of the budget. One of the first things I'd cut back if I had a significantly lower income is the amount that we spend on 'wants'. We'd cut back on eating out substantially and cut down on travel and entertainment. I wouldn't cut these things out all together as I believe they are important for quality of life. We'd cut back to 1 car. That would be doable for my wife and I since she doesn't work. This would cut our car insurance and car maintenance costs in half. I wouldn't skimp on insurance. Cutting back to one car would save about 50% on our insurance. I'd still keep my life insurance and car insurance at similar levels. I would keep the Health Savings Account health insurance plan at work since its the cheapest overall. But I would not put the max into the HSA, but instead put enough to cover the maximum out of pocket expenses. I would also get renters insurance. Keep in mind that this is just an example budget. The cost of rent, utilities or other 'needs' items will vary depending on your location and circumstances. I have $500 budgeted for eating out, entertainment and travel. I could change the exact amounts if I wanted based on my priorities. If for example I prefer to travel more then I could cut back the eating out budget and increase the travel budget. The surplus amount of $360 could go towards savings or other expenses that some people might have. I might also put a $100 buffer into a 'misc' category for stuff like car repairs or postage stamps or whatever else doesn't fall into the main spending categories that I've listed. A few months ago I stated my opinion that gold had peaked a year ago. Gold just hit $1,040 an ounce which is apparently a record high. So I was wrong and gold hadn't peaked yet. At this point I don't know if gold is really peaked or if it might still go up further. The article has one expert opinion that gold will hit $1,100 an ounce. I think thats pretty realistic, if it is at $1,040 then gaining +$60 doesn't seem too hard. But long term I still think that gold is on a boom and will eventually hit a bust when the recession starts to end. The article does say: "However, the weight of near-record long positions in New York gold futures still leaves the market vulnerable to a correction." Here is my next bold prediction : If you buy gold today it will be worth less 12 months from now. Of course this is just my on personal opinion and I'm not an expert on the precious metals market. Earlier today I got a couple emails from a company about a Who's Who registry. They were pleased to inform me that I'd been recommended for listing in their Who's Who registry. Of course there is no cost to be included. But I should hurry and sign up before September 16th (I got the email on Oct. 2nd). I followed the link to their website and get a form with my mailing address and phone # as well as a few fields about my information. Shortly after I got that email I got a second one sent to another email address with a different spelling of my first name. I guess I'm so special they wanted to make sure they included me under both spellings? I don't think so. The email I got failed to say WHY they were including me. What had I done to warrant such an honor? Apparently nothing at all except for having a publicly visible email address. I would bet you that this company makes all their money by selling copies of their book to people that they list in the book. Given that they sent me 2 mails in the same day to different addresses, I'm pretty sure they don't do any real screening or filtering to decide who is really 'worthy' of the 'prestige' of being included. They probably spammed that same email to 100 million people. Wikipedia entry on Who's Who mentions this practice and they explain : "Many Who's Who publications are vanity publications, where the inclusion criterion is the biographee's willingness to buy the book, with the business model consisting of selling books directly to the biographees." When I was a teenager in high school I got a fancy letter in the mail from such a who's who company saying that they were going to put me in the who's who of high school students. The letter didn't say exactly why they were adding me to their book, but it offered to sell me a copy for a keepsake. Initially I was pretty honored to be included in such a book, but since I hadn't done anything really note worthy in high school I was wary. And then the sales pitch to buy their book as a condition for being included cemented it for me that it was really just a way for them to sell the books. I'm sure many parents would be so proud of their kid for such an accomplishment that they'd buy such a book. The who's who books in question will also tell you how their book is in many libraries. That makes it seem legitimate. The only problem with that is that the maker of the book donates a copy of their book to those libraries just so they could brag about it being on the library shelves. So I'd say be wary of these offers. Ask yourself, have you ever desired to look up anyone in a who's who book? Probably not. They are probably just feeding off your own vanity in an attempt to sell you a book. Your noteworthy accomplishments are their own benefit. Getting your name listed in a book with 1000's of other people really isn't an accomplishment. I wrote before how it was taking months to get a refund from Verizon. They originally charged me $99.99 in July for not returning a broken modem that they hadn't asked me to return. I called initially and they admitted that I shouldn't have been charged and said I didn't have to return the modem. On the first call they said they'd refund me the $99.99. Time passed and I got my next statement with no credit so I called them again. Again in the second call they said that they would credit me but it would take 1-2 months to show up. That irritated me at the time and prompted me to write about it here. The September statement showed up and I had no credit still. So this time instead of calling them I I wrote Verizon another email asking them what is going on and when I'd get my credit. After that mail I finally got a credit from Verizon for the $99.99 that they had charged me. The credit showed up on my account last week. It took two phone calls and an email to get the credit. Verizon had apparently 3 people in a row mishandle this. The first person caused the charge to go on my account when it shouldn't. Then two customer reps in a row said they would fix it and didn't. It took me about 2 months to get the whole thing cleared up and by the time I get a refund Verizon will have had my money for 3 months. Thankfully $100 isn't going to hurt me, but the principal of the issue is very annoying. This is one major strike against Verizon in my personal book. JD at Get Rich Slowly talks about mortgages with Pros and Cons: 30-Year Mortgage vs. 15-Year Mortgage Personally I really like the option of getting a 30 year mortgage and paying it down early. It doesn't cost much more in interest and it gives you more flexibility. FreeMoneyFinance discusses a guy that got a huge break on the cost of college just by asking : Asking for Discount Nets Guy $40k I suspect that kind of thing would only work on a private school. A lot of people seem to worry about paying estate taxes when they pass away. But those people shouldn't really be worrying about estate taxes at all. The overwhelming vast majority of people will never have to pay any estate taxes. The estate tax has a very large exemption which means you do not need to pay taxes on that portion of the estate. Currently the exemption rate for 2009 is $3.5 Million. So right now only people who have estates worth more than $3.5M will have to pay a cent of estate taxes. Only about 2-3% of Americans have estates worth over $1 M, so very few of us have estates worth more than $3.5M. Under current law only a handful of rich people pay estate taxes. Are you a multi-millionaire? If you answered 'no' then you don't currently have to worry about estate taxes. If you are a multi-millionaire then congratulations, but you may want to consult with an estate planner to properly handle your estate after you pass including ways to deal with estate taxes. Estate tax laws have been in flux for a few years and are going to change one way or the other in the next couple years. The Economic Growth and Tax Relief Reconciliation Act of 2001 changed estate tax laws. Previous to 2001 the exemption was $675,000 and the law changed it to increase the exemption rate by steps through 2009 when it hit the $3.5 Million level. If current law isn't changed then there will be no estate taxes at all in 2010 and then in 2011 the exemption will drop. Its hard to say what will happen in 2011 exactly since it is quite possible that new legislation will be introduced to change the estate tax system yet again. Worst case the law will expire in 2010 and then in 2011 the exemption will drop back down to the $675,000 level. Still less than 10% of Americans have a net worth over $600K level. In September 2009 our Net Worth is $638,974 which is up $7,450 since August. Mostly the difference is due to retirement accounts increasing about $5,000 due to improvement in the market and my home real estate value increasing about $3,500. We also continued to pay down our mortgages and the debt balance dropped $1,800. On the negative side our cash balance dropped about $1,300. We have a vacant rental so lost out on over $900 rent.